There are several species of Bighorn Sheep native to the United States, such as the Rocky Mountain or the Sierra Nevada variety; however, it is the desert bighorn that is unique to Organ Pipe National Monument. Like their relatives, they are agile, shy creatures that can easily traverse rocky terrain. Current population numbers of desert bighorns are dwindling, however, with estimates of only 13,000 individuals, just ten percent of the estimated original population prior to westward expansion and colonization, Despite these alarming figures, the desert bighorn was removed from the endangered species list by the New Mexico Department of Game and Fish in 2011. While there is no hunting permitted within the National Parks or Monuments, poaching remains a rampant problem. The state of New Mexico contends that with management, the population will be able to sustain permitted hunting. The male desert bighorn sheep, with their massive horn curls, certainly make a great wall trophy for avid hunters, but their horns serve an important purpose in nature. Males are not territorial, but they are protective of their mates, so when a rogue male attempts to encroach on a sheep’s mate, the battle goes head to head and can occasionally be deadly. Females also grow horns, but they are lighter and do not curl. There is no specified mating season for the desert bighorn, but babies are most commonly born from January to April after a one hundred and fifty to one hundred and eighty day gestation cycle. Sheep herds are sometimes comprised of over one hundred, but it is more common to see herds of eight to ten female sheep roaming around the park. Mature males often remain solo. Desert bighorns are browsing herbivores and prefer to eat green grasses. However, in the harsh environment of the Sonoran Desert, they must seek out other sources of nutrients. “Preferred plant species vary with habitat quality, locality, and species availability, and may include fluff grass, catclaw, ocotillo spurges, buckwheat, mescal, janusia, slim triodia, Indian wheat, filaree, and weeds in season.” These flora varieties, which can be found on the rocky hillsides of the Sonoran Desert, provide a dependable base of nutrients, no matter the season or moisture levels for that year. The struggle for water in the heat of the dry summer months has spurred the bighorns to improvise; they have adapted to using their hoofs to kick open cacti in order to eat the moist insides and also obtain moisture from other plant and flower sources. The lesser long-nosed bat is one of four migrating species of bat known in North America and one of two to be considered herbivorous. These creatures often choose to spend the cooler months of fall and winter in southern Mexico and the hot summer months in southern Arizona, making them long-distance migrants. The bats that live in Organ Pipe Cactus National Monument are migrants, and like many other winged visitors, they are usually only there during the summer months. 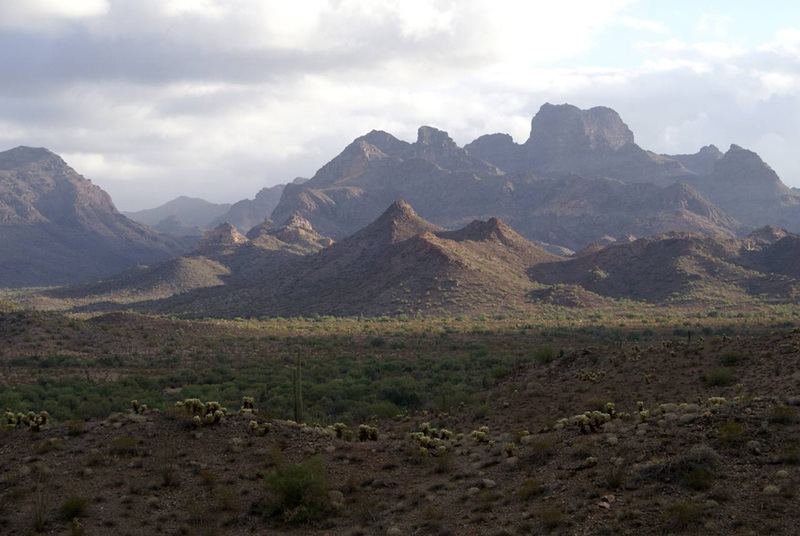 The long-nosed bats are an important cog in the circle of life at Organ Pipe National Monument. Their diet consists of pollen, nectar, and fruit of cacti, including saguaros and organ pipes. 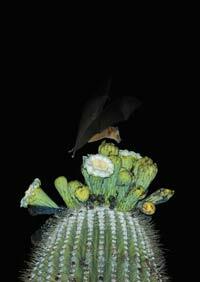 The spring blooms of these cacti emit a distinct odor that draws a massive influx of migrating bats. Feeding with its unique facial design, the long-nosed bat gets a good meal and gets coated in cacti pollen. As they move from flower to flower, they fertilize cacti and ingest seeds that eventually pass through the digestive tract and disperse through bat guano.This creates a “nectar corridor” along its migration path, which Ted Fleming, a biologist at the University of Miami, theorizes is crucial to the vitality of blooming cacti and other plants. His theory involves migratory bats feeding on flowering plants as they fly northward and agave nectar on their way south. Although their populations seem consistent for now, the large amount of human traffic along the border threatens plant life, and thereby, the lesser long-nosed bats’ migration ritual. The lesser long-nosed bats create their roosts in the Sonoran Desert. These sites found tucked away in abandoned mine shafts around the monument and are their preferred breeding grounds. The dark, cool and damp environment offers shelter from summer heat as well as protection from predatory birds and other mammals. Mother bats only leave the colony after nightfall to feed and make several trips back to check on their young. By the time for the return trip to southern or central Mexico, these pups will be old enough to fly on their own and make the journey with the rest of their colony. 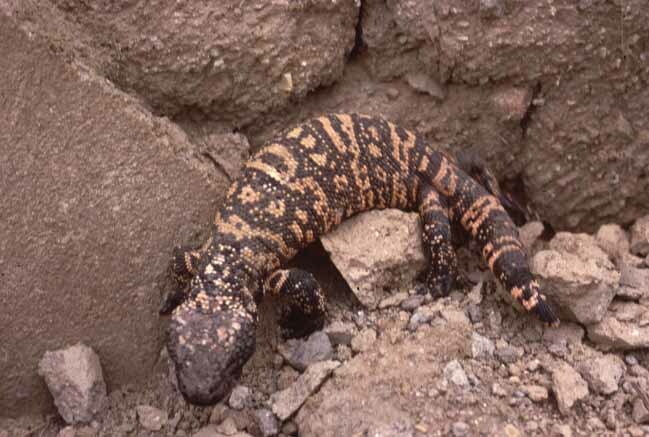 The gila monster is a rare and poisonous lizard native only to the Sonoran Desert. Its dark body and bright orange or pink patterns warns predators that this is one of two poisonous lizards in the world over. However, despite this frightful characteristic, these lizards are extremely slow and their venom is rarely potent enough to kill humans. The venom is mainly used to subdue their prey, which includes frogs, rodents, insects and nestling birds. Due to their inability to move quickly, they must sneak up on their prey and if they are unsuccessful, they are known to seek out stationary targets, such as bird eggs. Gila monsters do not eat often and when they are successful in hunting, they consume up to thirty five percent of their body weight in one meal. In defensive situations, the gila monster’s first instinct is not to bite its attacker. The lizard first tries to ward off any attackers by hissing, raising its head and attempting to run away. If this fails, the gila monster bites and chews its assailant to facilitate the painful venom’s seepage into the wound, which typically deters further confrontation. These creatures are often misunderstood and feared for their venomous bite, but it is illegal to kill, trap, or sell them in the United States. In 1952, they were awarded federal protection by the U.S. Fish & Wildlife Service, making them the first venomous animals to be protected in North America. National Park Service, “Bighorn Sheep,” National Park Service, http://www.nps.gov/orpi/naturescience/bighorn-sheep.htm (accessed April 17, 2012). cience/bighorn.htm (accessed April 17, 2012). 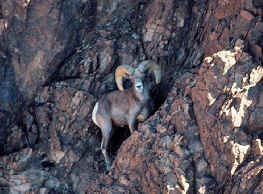 Desert USA, “Bighorn Sheep,” Desert USA, http://www.desertusa.com/big.html (accessed April 17, 2012). Liz Lastra, “Desert Bighorn Sheep Removed From Endangered Species List,” KOB Eyewitness News 4, http://www.kob.com/article/stories/S2358363.shtml (accessed April 17, 2012). National Park Service, “Desert Bighorn Sheep,” National Park Service, http://www.nps.gov/jotr/naturescience/bighorn.htm (accessed April 17, 2012). ation & Recovery Program, “Mammals: Desert Bighorn Sheep,” Virgin River Habitat Conservation & Recovery Program, http://vrhcrp.mesquitenv.gov/ (accessed April 17, 2012). Virgin River Habitat Conservation & Recovery Program, “Mammals: Desert Bighorn Sheep,” Virgin River Habitat Conservation & Recovery Program, http://vrhcrp.mesquitenv.gov/ (accessed April 17, 2012). Bats and White-Winged Doves: Travels and Tribulations of Two Migrant Pollinators,” in Dry Borders: Great Natural Reserves of the Sonoran Desert, ed. Richard Stephen Felger and Bill Broyles (Salt Lake City: University of Utah Press, 2006), 304. National Park Service, “Lesser Long-Nosed Bat,” National Park Service, http://www.nps.gov/orpi/naturescience/lesser-long-nosed-bats.htm (accessed April 17, 2012). San Diego Zoo, “Reptiles: Gila Monster,” San Diego Zoo, http://www.sandiegozoo.org/animalbytes/t-gila_monster.html (accessed April 17, 2012). Arizona-Sonora Desert Museum, “Gila Monster,” Arizona-Sonora Desert Museum, http://www.desertmuseum.org/books/nhsd_gila.php (accessed April 17, 2012). http://www.nps.gov/orpi/naturescience/lesser-long-nosed-bats.htm (accessed April 17, 2012).